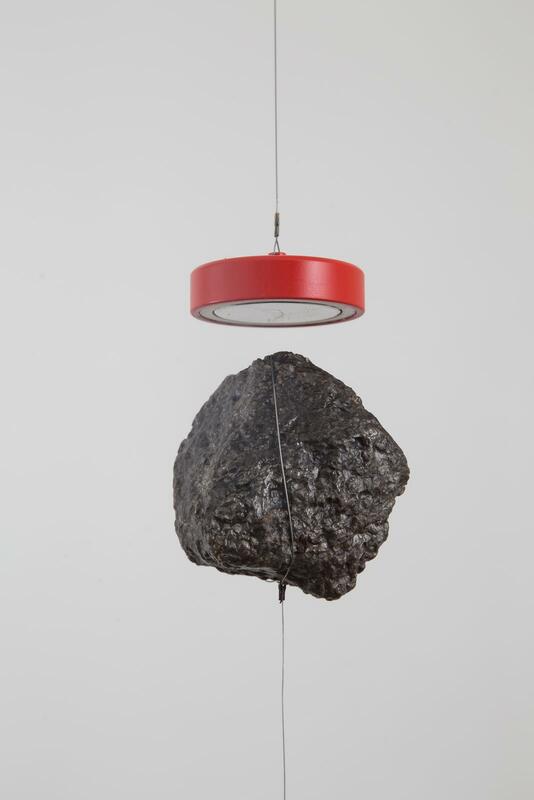 A meteorite hovers in mid-air, suspended by the attractive forces of a red magnet that is hung above it by wire. The meteorite, anchored to the floor with a thin steel wire, pulls the magnet towards it, holding it in place. The lengths of the wires attached to the magnet and the meteorite do not allow the two objects to ever meet. Instead, the pair move in a subtle anti-gravity dance, the small gap between them a gesture to both their mutual attraction and their inability to meet. Meteorites serve as a powerful inspiration for Olafur Eliasson, who emphasises the enormous spans of space and time bridged in the simple act of touching one.